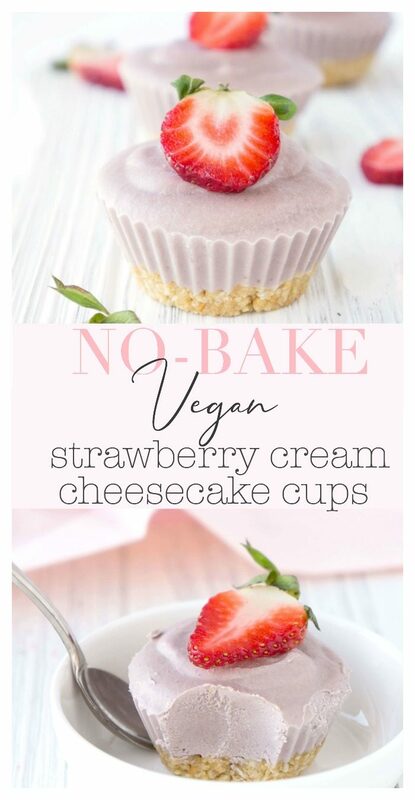 Since the no-bake vegan cheesecake recipes tend to be some of the most popular recipes on the blog, I’ve been brainstorming a whole bunch of new flavours for you guys! So far, we’ve come up with Lemon Berry, Pumpkin Spice and Chocolate Peppermint Cheesecake Cups which are all uniquely delicious in their own way. 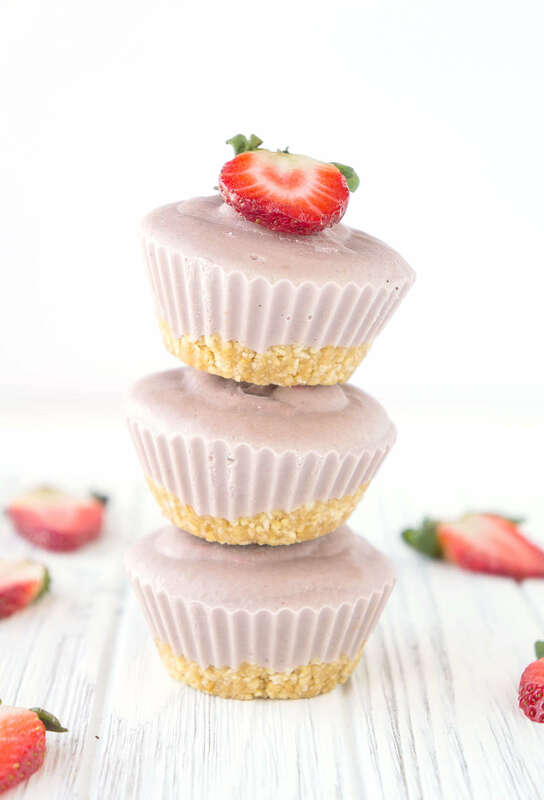 The latest version of these tasty little cups are these No-Bake Vegan Strawberry Cream Cheesecake Cups. Yes, it’s true that I partially designed this flavour simply for the colour, because who DOESN’T love a pastel-coloured cheesecake cup? But the BEST part is, the flavour is quite yummy too. 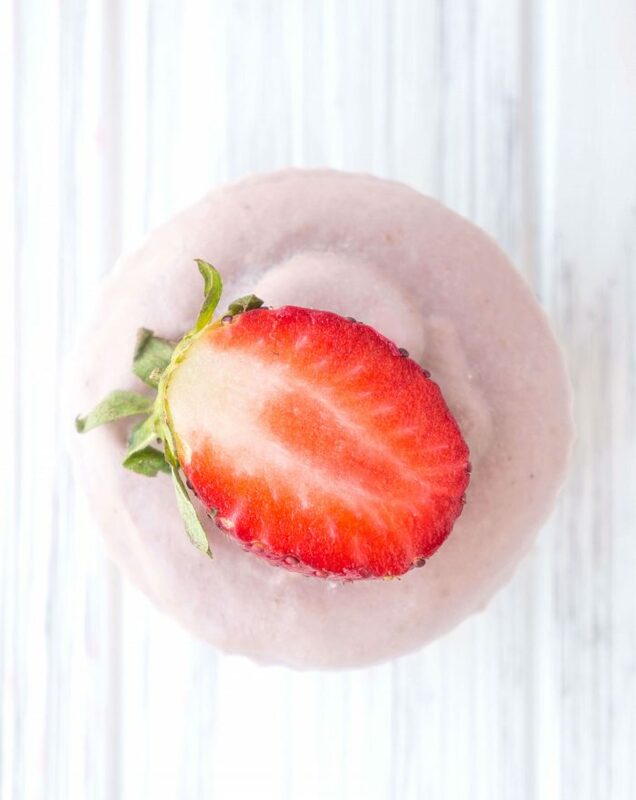 It’s almost like a cross between a strawberry frozen yogurt and a slice of cheesecake, but in this case, it’s completely dairy-free! 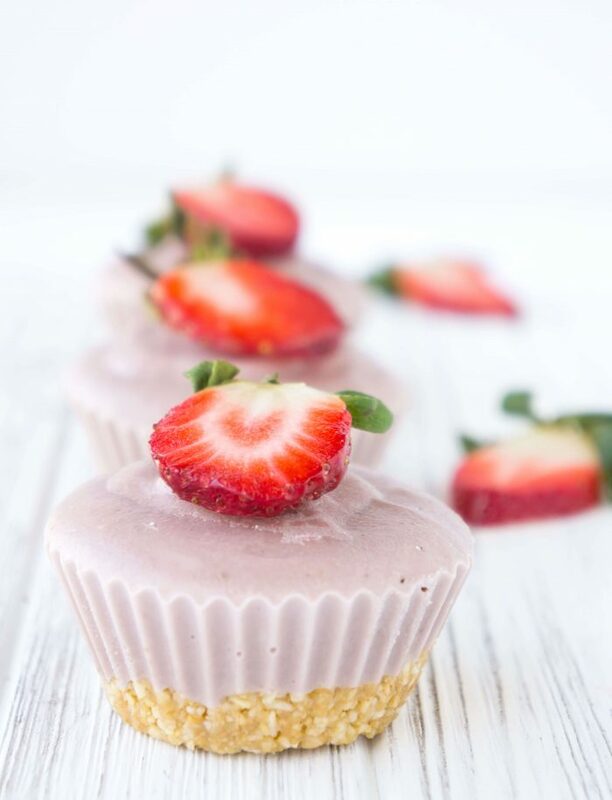 Well we worked a little magic with some cashews and coconut milk and other simple ingredients to form these creamy strawberry-infused little bites. First you’ll want to soak the cashews for at least 2 hours or overnight. I usually just like to put the cashews in a bowl of water and let them soak overnight so that I don’t forget the next day when life gets CRAZY and I can’t even hear myself think. Yeah. That’s life with a one year old for ya. Once the cashews are soaked, you’ll place all of the ingredients for the cheesecake mixture into a really high power blender. I’ve been loving the Ninja blender lately when I need to break up those tough-to-blend ingredients (like cashews, for instance) to produce a nice creamy and smooth mixture. Next, in a food processor you’ll want to pulse the mixture for the crust. The key here is to pulse it a few times since we don’t want to blend it into a paste. We want the crust to be slightly crumbly. 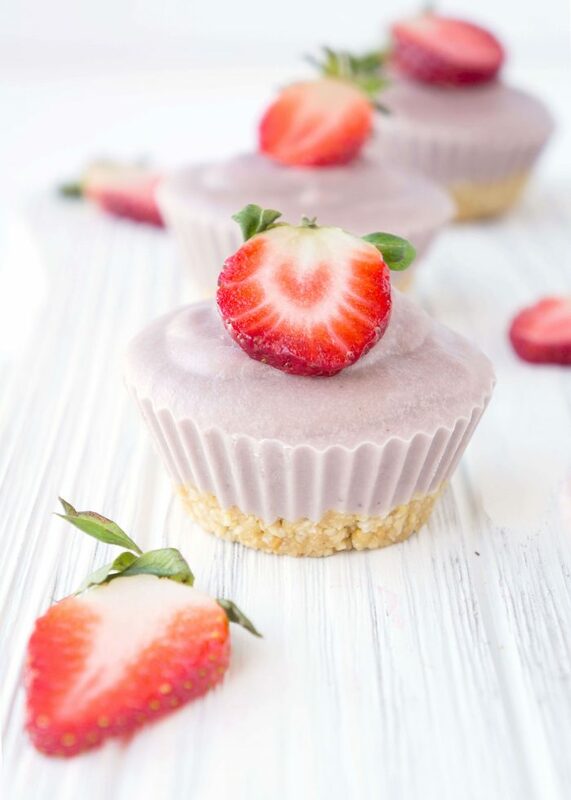 To make this recipe super EASY, I highly recommend getting some silicone baking cups for these cheesecake cups so that you can simply pop the cups out once they’ve firmed up rather than having to dig them out of the muffin tray and run the risk of completely demolishing these little masterpieces. That would be a total shame. Next, distribute the crust mixture evenly among 12 cups and press down with a spatula. I like to use a mini spatula to get all of the edges nice and packed down. Divide the cheesecake mixture and place on top of the crust. Place cups in freezer for at least an hour to allow them to firm up. 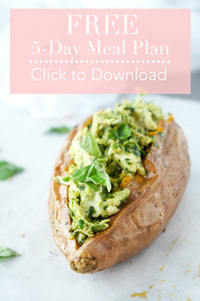 I like to store them in the freezer and take them out about 20-30 minutes before ready to eat, but you can also keep them in the fridge for up to a few days. When all ready to serve, simply top with sliced fresh strawberries and dig in! These no-bake vegan strawberry cheesecake cups are a healthier treat that the whole family will love. As an added bonus, they’re packed with healthy fats, vitamin C and fibre and are perfectly portion-controlled! So much goodness packed in these little cups! Blend ingredients for crust in food processor or blender, until crumbly (don’t mix for too long or it will become too creamy). Blend ingredients for cheesecake mixture in powerful blender. I found that a food processor didn't grind it fine enough. Line a muffin tin with 12 silicone baking cups. Evenly distribute the crust mixture among the cups and press down firmly with a small spatula or the back of a spoon until the crust is firmly packed down to the bottom of the cups. Next, evenly distribute the cheesecake mixture among each of the 12 cups on top of the crust layer and smooth it out so that the surface of each cup is relatively flat. When ready to serve, remove from freezer and allow to thaw for 20-30 minutes (or you can consume from frozen). Top each cup with fresh sliced fresh strawberries! *Soak the cashews for at least 2 hours in hot water to soften them up before placing them in the blender. This will ensure a smoother "cheesecake" consistency. 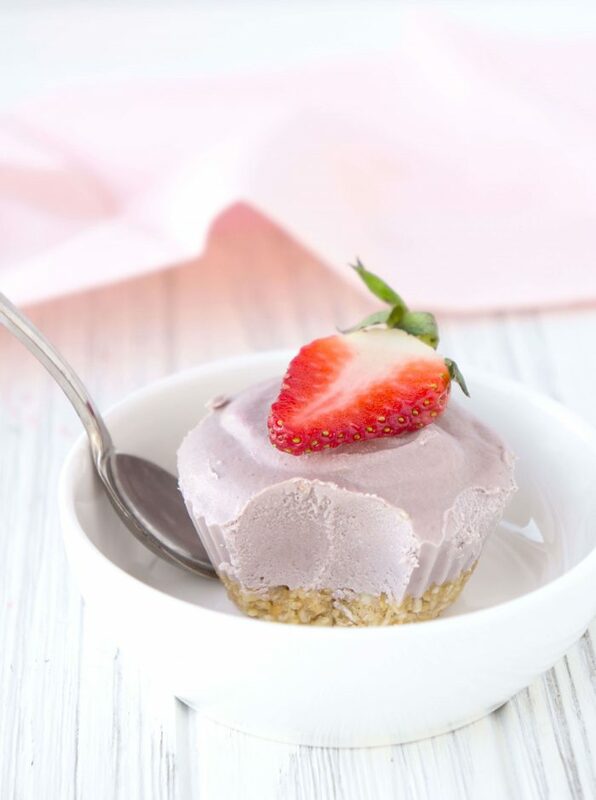 **As an alternative, you can make the no-bake cheesecake in little mason jars or glasses. Layer up the crust, "cheesecake" mixture and berries and stick the glasses or jars in the fridge to firm up for at least an hour. Serve straight from the fridge.